Revisiting Jonathan Richman’s brief “country moment” offers another window, through the eyes of an outsider into the genre. These days, when a musician (or a celebrity who wants to be famous for music, too) “goes country”, it’s hard for observers not to see it as a fairly transparent career move, even a last-ditch effort to find success in a new genre after your original one has grown bored with you. That can be true when it ends up working out for them, financially or artistically, or when it doesn’t. Examples are bountiful, ranging from Jewel becoming more overtly country, or Jessica Simpson rephrasing her career as a more country-ish one, to Darius Rucker’s journey from being called a “Hootie” to being inducted into the Grand Ole Opry. The history of country music is riddled with these so-called crossover moves. Indeed, the more you’re familiar with the overall history of the music, the less you can think of the genre as “pure”. There are classic country songs and albums made by non-country musicians who didn’t try to fully transform themselves into country acts, but rather saw it as taking on a different style, a different set of tropes and songs, and trying them on for a bit. Ray Charles’ Modern Sounds in Country and Western Music is one notable example, but there are many others. Millie Jackson did a country album (Just a Lil’ Bit Country). Lionel Richie’s country album from 2012, Tuskegee might have seemed like a completely left-field move if you didn’t know he had one small foot in country back in the day, writing a hit for Kenny Rogers and doing a song with Alabama. Keep digging back through pop music and you’ll find many places where pop stars hit big on the country charts and vice versa. Bing Crosby had a country #1. The Bee Gees wrote a country hit for Dolly Parton and Kenny Rogers. Country and pop music, and their related sales charts, have never been discrete entities. Jonathan Richman’s 1990 album Jonathan Goes Country is part of that whole story and also seems somewhat separate from it, if only because at that point in his career he was the type of eccentric pop/rock singer/songwriter, a cult hero mainly, who wasn’t going to reach some new success among country crowds, and he knew that. I doubt he expected to reach a new audience, or for anyone to listen to his country album except the already devoted fans of his music. It was clearly done as a lark, just him indulging in some country themes and styles for fun. Perhaps it simply came out of Richman befriending the musicians whom he recorded the album with, and thinking if he was going to do an album with them it should be more on their ground than his. Jonathan Goes Country was recorded in Springfield, Missouri with that city’s band, the Skeletons, backing him up. 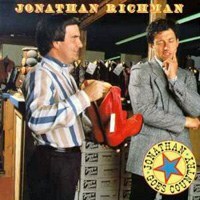 Right on the album cover is a jokey representation of Richman as the snooty New Englander, almost as if he’s “going country” against his better nature – a salesman shows him a pair of cowboy boots and he turns up his nose at them. Jonathan Goes Country isn’t a landmark release in country music or a landmark release for Richman, even. It’s essentially just another album of his, one that even his big fans are likely to put somewhere in the middle of his discography. For me, that somehow makes it an even more interesting album to study, to see what his take on country music says about the genre, and at the same time, to see what country music as a genre does, or doesn’t do to Richman and his music. The album is in part a tribute to country music, and in part a relatively typical Richman album. He lightly countrifies three of his older songs: “Corner Store”, “You’re the One for Me”, and “The Neighbors”, and he plays some country classics. There are instrumental versions of Tammy Wynette’s “Your Good Girl’s Gonna Go Bad” and Skeeter Davis’ “I Can’t Stay Mind at You”. He sings Porter Wagner’s “A Satisfied Mind” and Marty Robbins’ “Man Walks Among Us”. When he’s paying tribute to country past, he’s also paying tribute to the American past, recalling in a romantic/nostalgic way the past as he imagines it. That’s something he does in his own songs, and definitely does here, too. He’s written songs about how parties aren’t as good as they once were, cities aren’t as good as they once were; about baseball and places from the past, places that aren’t the same anymore, painters who are better than today’s painters. The America he sings about on Jonathan Goes Country is a suffering one – shopping malls are replacing mom-and-pop stores, people are travelling in their own cars instead of communally and the neighbors are nosy. Even the goofiest of his songs have sadness within them. The album starts with “Since She Started to Ride”; he never sees his wife now that she’s riding horses. It’s an excuse to make references to various pieces of horse-riding gear, in a clever/funny way, but when he sings, “and she’s tired in the evening / and she’s gone in the day”, you can hear the sadness in his voice. If the album says something about country music, it could be that country is so thoroughly infused with loneliness that it’s always somewhere in there, even under the surface, even when you’re joking around. Or it could be that country music is so often an expression of homesickness. Richman sounds perennially full of longing to get back to some home that probably was never there in the way he remembers it, which is one trait of country that’s built into both the early stuff and the most polished of the contemporary, pop-leaning stuff. Richman singing “Man Walks Among Us” may serve as a reminder of country music’s association with nature/the environment, but really it’s just as much a sign of his own affection for the western sound in the country music of the '50s. There are ghosts in that song and in the others, and they’re as much ghosts of country music past and ghosts of America’s past as they are the usual ghosts of Richman’s past (or imagined potential present/futures) that are always haunting him. Perhaps the most interesting song here, in terms of its relation or non-relation to country as a genre, is the one where he’s singing mainly in the present: “The Neighbors”, a Richman original that was first on his 1983 album Jonathan Sings! (an album he’s expressed unhappiness with, which might be a reason two of its songs are present here). Though nothing marks it as a small-town song, and really its characters could be living anyway, the song gets to a common city-person’s perception of small-time life: that the neighbors are all busy-body gossips who have nothing better to do than worry about what everyone else is doing. The difference, though, and the way the song may diverge from country-music texts, is that what he wants to keep secret is a little different – not a secret love, per se, but his habit of walking around in public holding hands with women other than his wife. His wife doesn’t care, why should the neighbors, is his basic message, though his intentions with the relationship are always a little fuzzy. The song both plays into and out of your standard lovers-meeting-under-the-cover-of-darkness country cheatin’ song. If ultimately Jonathan Goes Country makes no statements, about country or Richman, that have had any big impact on music overall (it’s likely to always be one of those albums that just is), it does at least exemplify the way a musician can play around with country music without adopting it as a new lifestyle. It can’t help but make us wish for other performers, of all genres, to do something similar, just to see what happens. Country and pop both can use more slightly oddball turns like these. To succeed the way Richman does – which means, to not succeed at all, in terms of the bigger picture, but to succeed in terms of his own limited ambitions – a musician may have to be willing to let an album stand as “just another” one, or even as an out-of-character misstep, instead of expecting a big universally acclaimed masterwork. In a way, that attitude seems somewhat more common in country music, especially these days, where the stars often seem to be using their albums as tools just to keep their name out there, as a reason to go on a tour or do some endorsements, where the real money is. For that matter, if albums themselves don’t make that much money anymore, shouldn’t they be the perfect places to just play around?